Hi Younger Dryas. The question here I think is, "Why look for an alternative theory for the salinity of the Seven Seas, when we already have a perfectly good, time-tested explanation?" many cases there were two: one flood at creation, and one later flood. There, five good reasons! (: But I will start a thread for discussion of the constant level of salt in the oceans, because that is a key, either way you look at it. Thanks for providing the info on Salt Content - the most interesting take-away, higher salt content = greater conductivity. About a million times more than freshwater. Lets forget the word "Flare"
The current will take a more or less straight path to the ocean floor, and the sea water which is a very good electrolyte will start breaking down into chlorine gas and sodium ions, which will combine with the remaining water to form sodium hydroxide and generate a lot of heat. Climatic record might show a significant warming period (Holocene Climatic Optimum) - which would be a strong indicator of when using whatever chronology you feel most comfortable with. Fresh Water + Warmer Global Temp's + Stronger Magnetic Field (today the Salty Oceans account for 2%) are just a few of the benefits we all here in the present tend to forget to appreciate. 1. Lightning does strike the surface of the oceans, and it would be really good to look into anything that is published on that! There are sometimes huge mortalities of fish, whales and dolphins, which I have thought could be because of a lightning bolt striking the sea water. My guess is that even "a glow mode discharge", as YoungerDryas put it, would be deadly -- either because of heat or because of electrocution. And it so happens that according to one study, the ocean temperatures have shot upwards by 18-20 deg F before. Also, according to mainstream paleontogists, over 95% of marine species have gone extinct. We find their fossils on the continents. 2. The climatic extremes, especially glaciation, which would be associated with all of the water vapor/electricity of the Saturnian flare is a great point. On the other hand, in the catastrophic scenario, the rapid appearance of oceans would result in the development of the Hadley and other cells, the trade winds, and the rain shadows, which would be a complete change from previous conditions. Last edited by Brigit Bara on Sun Jan 20, 2019 6:08 pm, edited 1 time in total. Another question is, "Is there enough salt water in Saturn's rings right now to fill the Atlantic and Pacific Oceans?" From Cassini: "The gravitational pull of the rings indicates their mass, which in turn indicates how old they are. The more time these icy rocks spend out in space, the heavier they get, contaminated by passing space debris. In case you were wondering, the mass of the rings reaches around 15 quintillion kilograms (about 16.5 quadrillion tons), roughly 5,000 times less mass than our own Moon." By the way, I really like your model, YD. I am not arguing against it necessarily, but I do take Velikovsky's use of the words "nova" or flare as literal terms indicating rapid events. He thought that seven days of brightness preceded a sudden ejection of gas or water, which was deposited on Earth. "Enough to fill the Atlantic Ocean," he said. The electrical deposition and removal of materials from Jupiter's moons might be an example of slower processes; but on Io at least, those exceed the brightness and heat of volcanoes. You may have problems with dissociating the water! After that, H2 and O2 are very very explosive when they mix. Perhaps Enceledus is a living laboratory for deposition and excavation of a satellite involving water. It's salt water is found in the furthest ring of Saturn. That might suit your model better. A few thousand years and voila. But in that process we see water removed more than deposited. "The gravitational pull of the rings indicates their mass, which in turn indicates how old they are. The more time these icy rocks spend out in space, the heavier they get, contaminated by passing space debris. I find the use of terms and method of thinking here to be highly suspect. An extreme leap of faith comes from such ridiculous cause/effect scenarios. There is absolutely zero proof from mainstream gravity astrophysics which can explain the rings formation, presence, or longevity. And while recent papers claim to determine the mass/gravity of Saturn changing based on 'waves' in the rings, I would treat any claims about age/mass/gravity with some disdain when the electric forces are not considered. Curiously the world's largest deposit of Salt is located underneath the Great Lakes. Which themselves are a geologic enigma to mainstream. Admittedly my knowledge of Salt production is limited but from what I understand, a large mine is dug, water is pumped to dissolve the salt below, this water is then hydrolically pumped back to the surface to evaporate leaving, for example common table salt behind. My lingering question; was the Salt created (Chemically) as a result of the Electric Interaction? Or did the Interaction simply create similar conditions to our modern day Industrial processes? And harvest the Salt, which had pre-existed deep below for any number of beneficial usages? Most fish are restricted to one environment because they cannot change the way they osmoregulate, but some species spend periods of their life in both environments because they are able to switch between the two methods of osmoregulation. Collectively, these species are known as euryhaline fish, a category that can be further split into those fish that spend most of their lives at sea (anadromous fish), and those that spend most of their time in fresh water (catadromous fish). Although many euryhaline fish can tolerate extreme changes in salinity, most require a gradual shift from one environment to the other to allow their bodies to make the necessary adjustments. I agree; but those were the only figures on offer. I am never sure if the densities of the moons or planets, or even our moon, are correct. But it is interesting that the rings appear to be fairly bright, and the suggestion here is that with age, they will become dustier and therefore darker. "The more time these icy rocks spend out in space, the heavier they get, contaminated by passing space debris." Curiously the world's largest deposit of Salt is located underneath the Great Lakes. Which themselves are a geologic enigma to mainstream. Admittedly my knowledge of Salt production is limited but from what I understand, a large mine is dug, water is pumped to dissolve the salt below, this water is then hydrolically pumped back to the surface to evaporate leaving, for example common table salt behind. And it is also mined by shafts, rails, cars and earth movers. It would be a real treat to go see some of the old salt mines in Michigan, and the coal mines in the continental shelves also. I have read the ceilings are very strange. When halite is mined, they get potassium and magnesium salts, along with iodine and bromine from the process of purification. This gives some circumstantial evidence that those gigantic salt domes are actually evaporates of ocean water. Why would the salt deposits be vertical, instead of being in a huge lake or sea bed, like the Salt Flats of Utah? I have a guess about that, but a new salt dome thread might be a better place for it. But electricity traveling through the Earth provides the heat to evaporate the water, and cause some chemical changes, in my view. January 26, 2011: For years researchers have been debating whether Enceladus, a tiny moon floating just outside Saturn's rings, is home to a vast underground ocean. Is it wet--or not? Now, new evidence is tipping the scales. Not only does Enceladus likely have an ocean, that ocean is probably fizzy like a soft drink and could be friendly to microbial life. The story begins in 2005 when NASA's Cassini probe flew past Enceladus for a close encounter. Cassini found the little moon busily puffing plumes of water vapor, icy particles, and organic compounds out through fissures (now known as "tiger stripes") in its frozen carapace. Mimas, a nearby moon about the same size, was as dead as researchers expected, but Enceladus was precociously active. Many researchers viewed the icy jets as proof of a large subterranean body of water. Near-surface pockets of liquid water with temperatures near 32o F could explain the watery plumes. But there were problems with this theory. For one thing, where was the salt? In initial flybys, Cassini's instruments detected carbon, hydrogen, oxygen, nitrogen, and various hydrocarbons in the plume gasses. But there were none of the elements of salt that ocean water should contain. NASA apparently was actively looking for salt water! Now we were speaking of the other salts and elements obtained when mining and purifying halite on Earth. "It wasn't in the plume gasses where we'd been looking for it," says Matson. "Instead, sodium and potassium salts and carbonates were locked up in the plumes' icy particles. * And the source of these substances has to be an ocean. Stuff dissolved in an ocean is similar to the contents of these grains." The latest Cassini observations presented another intriguing discovery: thermal measurements revealed fissures with temperatures as high as -120o Fahrenheit (190 Kelvin). Brigit Bara wrote: Now we were speaking of the other salts and elements obtained when mining and purifying halite on Earth. Thats all really great info Bridget! I wonder though if perhaps Salt is simply an Electric discharge, similar to water. Perhaps Earth's large salt deposits might provide a map of interactions having taken place historically? Also it appears we have the framework to successfully terraform/ressurect a planet that contains salty ocean + atmosphere. We can call it "ElectroCulture"
Also 'Salt Licks' provided the early roads for our Ancient Ancestors, using the paths carved out by mammals travelling to get their mineral deposits! Which I thought was a pretty cool tie-in. I think you are right, "Earth's large salt deposits might provide a map of interactions having taken place historically." Like you said, there are huge deposits under the Great Lakes, and I just read that there is a huge salt deposit underneath the Mediterranean Sea. The salt domes are sometimes miles across, and vertical. There are also vast fields of salt evaporites in deserts across the world. And there are thick layers of salt interspersed with clay layers deep underground. A lot of the geological textbooks are trying to answer for these huge halite deposits. But I do agree that they are evaporites, formerly dissolved in sea water. (Did you mean to say they are not evaporites?) How rapidly and by what heat they were laid down is the question. And why they are associated with oil fields is another question. --In my view, it isn't just salt that provides a map of the powerful electrical discharges, it is every single feature of the planet that provides a map of the interplanetary thunderbolts. (: But the secret to reading the Leichtenburg scarring of Earth is understanding that it was fully submerged in water, in at least two of its most extensive scarring episodes. Haven't we all wondered, uniformitarian and catastrophist alike, "Where did Earth's water come from?" According to Velikovsky the brown dwarf star, Saturn, has undergone catastrophic nova activity, and drenched its former satellite. 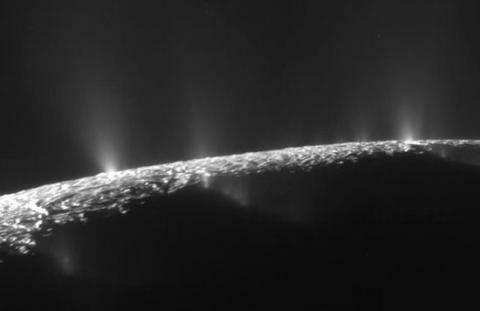 He said the salt or chlorine of Saturn's water and ice would match that of our oceans. And so far, the salts, isotopic ratios, and possibly magnesium and bromine, have matched Saturn's rings. Check out the size and local of the Bonneville+Salt+Flats, and it's relation to Yellowstone, the Navajo Reserve, and the Grand Canyon.